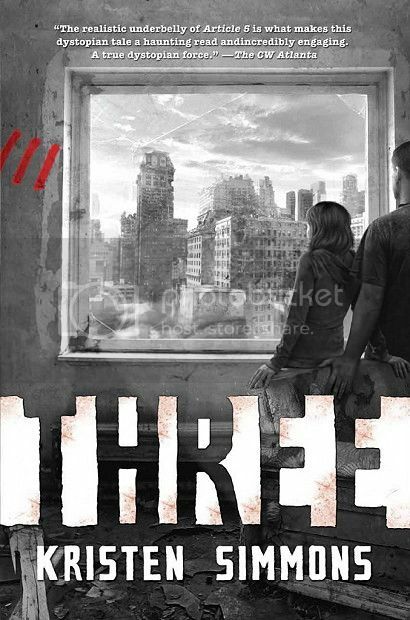 Kristen Simmons' fast-paced, gripping YA dystopian series continues inThree. Today The Cover Contessa is excited to welcome Kristen to the blog for an interview! Take is away Kristen! Hi Brooke! Thanks for having me! Well, when I was really little I wanted to be a professional hockey player. But then I realized I sucked at ice-skating so that was out. I wanted to be a mental health therapist too…and then I became one! Writing is actually my second career. It depends. I wrote Article 5 fairly quickly (though I edited it for over a year). I usually do research for a while, think for a while, plot for a while, think some more, all before I actually sit down and start typing. Once that happens, maybe 6 or so months for a first draft. Ha! I used to! Now I have a toddler. I write during nap times or when he goes to bed. I do have a method for each session though – I like to start with what I wrote the previous day, review and do a little editing, and then move forward into the next section. It helps get my mind in the right place. Pretty well, I think. My husband is pretty understanding. My toddler, not so much, but he doesn’t really get why anyone would stare at a Word document when they could be watching Elmo movies or banging on pots and pans. I guess what I should say is, they keep me balanced. Suspense and kissing. But that’s just me. 6. What was the hardest thing about writing a book? Cutting your favorite scenes. Oh, it’s so sad to see them go! People always say, just keep them for later but I never find a place for them. Poor little scenes. So sad. Hope your readers enjoy THREE, Brooke! Thanks for being a part of the blog tour! Thanks so much for stopping by, Kristen! It was so great having you here! I don't know how she writes with a toddler! I have a 4 year old and work from home and most days are rather frustrating, just trying to get everything done! He hasn't napped in years, and doesn't seem to need much sleep. I guess we do what we gotta do! I haven't read these books yet, but I know I really need to! I KNOW!!! I can't get anything done when I'm home with my 4 year old! Thanks for stopping by! Thanks so much for the interview! I'm honored to be on your awesome blog - and it is awesome. Bloggers rule! Thank you, Cover Contessa! Such a pleasure to have you on the blog! Congrats on finishing the series!